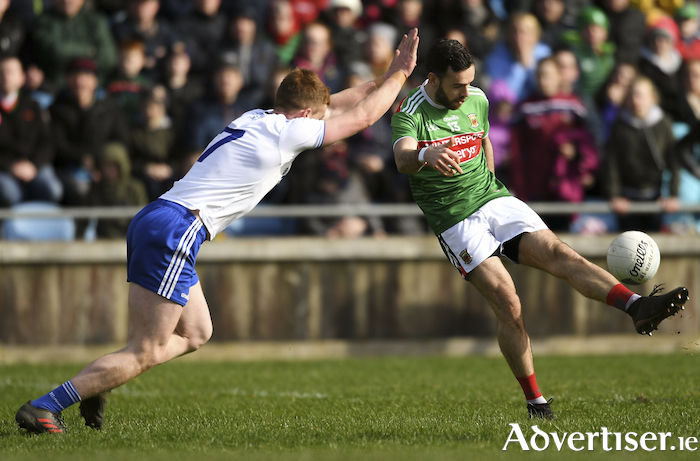 Mayo knew that things had to go in their favour elsewhere if they were to make next Sunday’s league final – but they still had to take care of business themselves to make sure they were still in with a shout of a place in the final. James Horan placed his trust in his full squad before a ball was even thrown in – the match day 26 not featuring the likes of Andy Moran, Lee Keegan, Keith Higgins and initially Colm Boyle – the Davitts man was drafted into the bench late on for an injured Michael Plunkett, but even when the game was in the melting pot late on Horan resisted throwing the experienced defender into the fray. Mayo won by three in the end – it probably should have been more having been eight points up with a man advantage at one stage, but with Monaghan not wanting to have to rely on favours from elsewhere themselves to stay in the top flight for next year they kept fighting right until the bitter end. The visitors played with the aid of a strong breeze in the first half and opened the scoring inside the first minute with Jack McCarron pointing from distance. Mayo’s first score came six minutes and it was a major one with Kevin McLoughlin rolling the ball under Rory Beggan following some brilliant build up play involving Aidan O’Shea who picked out Darren Coen with a inch perfect pass, the Mayo full forward held his nerve and released McLoughlin at the right time and he applied the required finish from close range. Monaghan could have rattled the net themselves not long after when Karl O’Connell sped through the Mayo defence – but he was brilliantly stood up by David Clarke, who then got down to block the ball at the Monaghan defenders foot. Points from Conor McManus and Jack McCarron had Monaghan level by the 14 minute mark and they had a decent shout for a penalty waved away ten minutes in when McManus got in behind the cover – but referee Derek O’Mahony waved play on. Jason Doherty edged Mayo in front again on the 15 minute mark from a free and that was quickly followed up by the first of three fine first half points from Fergal Boland and one from James McCormack to put Mayo three clear. The lead was pushed out to four from the second point from Boland of the day – but Monaghan kept tabs on Mayo with McCarron hammering over two fine scores from play. Boland and McCarron swapped points and then four minutes from the break McLoughlin netted for the second time on the day finishing off after some quick hands between Aidan O’Shea, Diramuid O’Connor and Boland to put Mayo into a 2-5 to 0-5 lead. McCarron kept Monaghan in touch with another top quality finish, but a long range effort from Aidan O’Shea and pointed mark by Brian Reape sent Mayo in leading 2-7 to 0-6 at the turnaround. Mayo lost David Clarke to injury after he was caught late by Darren Hughes before the break – seeing the Ballina man replaced by Rob Hennelly for the second time in as many weeks due to injury during a game. McCarron just like the first half kicked the first score of the second half to close the gap to six points, before Rory Beggan and Rob Hennelly traded points from long range frees – before a brace of points from Conor McManus made the score 2-8 to 0-10 in favour of Mayo. Monaghan were dealt a blow to their chances when Fintan Kelly was shown a red card for a late tackle on Fergal Boland nine minutes into the second half – which was quickly followed up by points from Darren Coen and Kevin McLoughlin to put Mayo six clear once more. The Farney men though were about to land a blow that could have really rattled the Mayo cause when Darren Hughes got in on the end of a swift passing move and finished the ball to the back of the net to cut the gap back to three. However Mayo hit back with a three pointer of their own not long after – Diarmuid O’Connor cut down the left flank and flicked the ball into the path of McLoughlin, the Knockmore man palmed the ball goalwards only for Beggan to pull off a top class save. But the resulting melee from the save saw the ball forced over the line for goal number three for Mayo – to go six clear again on a score of 3-10 to 1-10. Brendan Harrison could have went for goal number four on the 50 minute mark but opted to punch the ball over the bar for Mayo’s 11th point of the day. It looked like it was only a matter of seeing out the game from this point on for Mayo, but Monaghan were not done by any means and kept eating into the gap – closing it to as little as two with six minutes left on the clock – but Mayo were able to eek out the scores they needed to run out three point winners and set up a crack at Kerry in the league final next weekend. Monaghan: Rory Beggan; Barry Kerr, Drew Wylie, Ryan Wylie; Karl O’Connell, Conor Boyle, Kieran Duffy; Darren Hughes, Neil McAdam; Ryan McAnespie, Dermot Malone, Owen Duffy; Conor McCarthy, Jack McCarron, Conor McManus. Subs: Stephen O’Hanlon for Malone, Dessie Moane for McAdam, Vinny Corey for Dew Wylie, Owen Duffy for McCarthy.